Westeros is at war. Great houses clash, dragons rule the sky, and the army of the dead threatens the realm. Live out your fantasy and join the war. Build your house and raise your army as you navigate a dangerous political landscape. 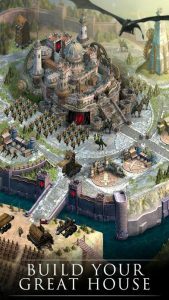 Based on the award winning HBO series, Game of Thrones Conquest allows players to become a Lord in Westeros and define a strategy for conquering the Seven Kingdoms. Winter is here and your enemy’s army will not wait to clash swords. Wage war and join the battle today to capture the Iron Throne! Only in Game of Thrones Conquest can you become a lord of Westeros and navigate the dangerous political system as you Fight for the Crown. Interact with key characters and capture iconic locations from the award winning HBO TV series. Dominate your enemies by using an innovative Allegiance System that allows you to recruit your friends as bannermen as you rise to take The Iron Throne. I like the game but it just has to many bugs and crashes a lot you should really fix that and I don’t like the fact that you can’t write a player directly it would help when trying to recruit bannermen. I also think that it’s stupid that you can’t get certain resources until you reach a certain level ,also the amount of time it takes to gather resources is too long you should shorten it there’s no reason why gathering 12k resources takes an hour it’s ridiculous, it also put a strain on the resources because you only have one area ( the north) for us to conquer right now so that’s where everyone is at. I wish you would open all regions to be taken because right now it’s an all out death match for seats of power and it’s kind of hindering some people to grow because they keep getting attacked which is inevitable when everyone is in the same place please fix this. I know, the game is in early stages and it will get better and the glitches will be gone. The reason I give it 3 stars is because of the micro-transactions. We were the best allegiance in our server until another allegiance took ironrath from us with a ridiculous amount of troops that were really high level. That is pay-to-win. Micro transactions should only be used for cosmetics, teleports and stuff like that. I know, mobile games, but i think this game can do without micro transactions because game of thrones is pretty popular and a lot of people will be downloading it just because of the series. That’s my opinion. It is pretty annoying getting beaten by guys who have bought everything. Maybe make servers only for people who buy stuff? But after all i like it.